On Saturday, September 29th, the chapter held a Youth Fishing Rodeo at our chapter park. The event was originally scheduled for September 15th but was postponed due to weather concerns associated with hurricane Florence. As it turned out, Saturday was a perfect day for the event. The weather was cool and sunny. Apparently even the fish got the reschedule memo because participants managed to catch and release over 150 fish. Most of the fish were Bluegill but some small large mouth Bass were also caught. Best of all, every participant was able to catch at least one fish. The picture to the left is of a young participant with the first fish he had ever caught. The kids learned how to rig their poles, bait their hooks, cast their lines and the proper method to catch and release the fish. Volunteers explained our creel limits and how we use those limits in conjunction with catch and release methods to rebalance and maintain fish populations in our pond. While the kids were fishing they got to check out some other wildlife in their natural environment. The pond turtles were a big hit, especially the huge snapping turtle that cruised up to the shoreline to observe the festivities. 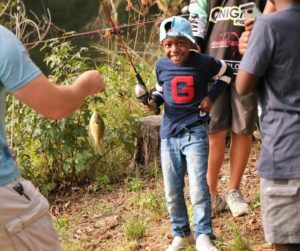 To remind them of their days adventure, all the young anglers received a certificate for catching their first fish, catching a bluegill or catching a large mouth bass. After the certificates were presented, everyone had hamburgers and hot dogs for lunch at the Gazebo. Based on the conversations over heard during lunch, it is apparent that you don’t have to teach the kids how to tell “fish stories”. Several of the kids spent the rest of the afternoon at the archery range. The youth bows and arrows got a good work out as chapter volunteers instructed the kids in range safety and proper archery techniques. Comments from the kids, their parents and chapter volunteers indicated that this event should definitely be repeated. Chapter president, Ray Powell, summed it up when he said, ” It was wonderful to watch kids having so much fun riding on a hay wagon, catching fish and shooting bows and arrows on such a beautiful fall day at our chapter’s park”.